The dragon awakens. All under heaven - tian xia. A Communist state with a capitalist economy. To get rich is glorious. Whether a cat is black or white doesn't matter, so long as it catches mice it's a good cat. The future superpower. The Middle Kingdom. The mountains are high and the emperor is far away. The above are just some of the many tired clichés about China that I will diligently avoid in this post. The simple fact is this: the United States, the richest nation on earth, has given its wallet to China in exchange for the fleeting pleasure of cheaper consumer goods. China now has America's cash - bags of it (estimated between US$1.75 -1.87 trillion in June 2010). And while Rome's will was enforced by the legions, and Britannia's through the might of the Royal Navy, China will buy your compliance. As a strategy, it is superb in its subtlety and simplicity. Despite the massive expansion in its military budget, China has almost exclusively focussed on the defensive, militarily speaking. Even the much feared DF-21 is, in essence, a defensive weapon - China does not want to take on the US Navy globally with massive carrier battle groups of its own, it simply wants to keep the US out of what Beijing perceives as its maritime patch, using a (admittedly game-changing) land-launched anti-ship missile. 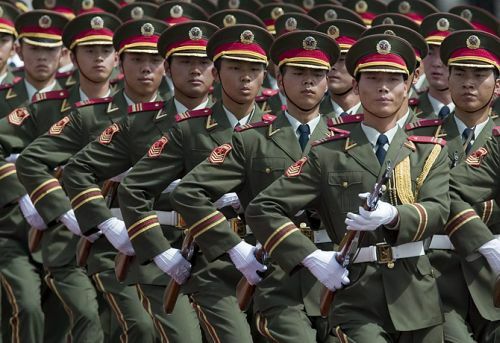 It is with economic force, rather than its military, that Beijing will go on the offensive - and economic offensives tend to be more profitable than military ones. China's involvement in Africa is well-documented (interesting documentary on the topic by Al Jazeera's Witness programme here) and while some would argue this push into the continent is commercially driven rather than politically or diplomatically led, the latter will inevitably follow the former. China is in Africa, in a nutshell, to buy up resources in exchange for hard cash and investment in local infrastructure. I'm fairly certain that, if you were the leader of Zambia, you would listen to the country that was building your roads. Having already developed a sphere of influence in Africa, both commercial interests and growing diplomatic stature are ensuring that China now looks for new horizons. Its involvement in South America is well underway - a growing presence in Europe is surely inevitable. Only this time, China will be the cash rich senior member in an investment partnership, rather than merely the hawker of cheap OEM goods to European customers. How can money-savvy China pass up the opportunities that flagging economies in Europe like Spain, Portugal and Greece offer in terms of depreciated assets and the ability to acquire political capital and prestige at bargain basement prices? And if a flagging economy is a big draw for Chinese investors, well, no one flags better than Ireland! What's more, the usual Irish gombeen approach to business won't work with the People's Republic of China - they know how to play us. Witness the recent promise by Chinese investors to create 1000 jobs in Athlone in a Euro-China business hub. Only catch- those 1000 jobs would be for Chinese immigrants, not the local Irish. The Chinese recognise that Ireland, for the last few years, has focussed almost exclusively on property to the detriment of all other sectors of the economy. And until we can offer them greater incentives than our over-stocked landbanks, the Chinese will only invest in one thing here - land. That's why, in a rare note of seriousness, this blog is advocating that Ireland proctively grab China's future economic expansion into the EU as the opportunity we need to kick-start our economy, by offering China unique skills that set Ireland apart from our fellow EU members. We have one massive advantage over the rest of the EU for attracting Chinese investment - a little-known fact is that China is an English speaking country, or at least, it is fast on the road to becoming one. As the only English-speaking member of the Eurozone, and as a small, non-threatening nation with no history of imperialism, Ireland is ideally positioned to act as China's partner in Europe. Rather than seeking masses of manufacturing jobs, we need to offer China our knowledge of the EU regulatory environment, our experience of dealing with Brussels, and our ability to network throughout the community, to grow Ireland as the ideal destination for Chinese companies to locate logistics, sales and compliance hubs for their European operations. Let's see you invade the pitch at Croker now. As a solution to our economic woes, its not perfect, and much work needs to be done - such as beefing up Ireland's paltry representation in China, and introducing Chinese as at least an optional foreign language in schools would be a good start. But as a plan for the future, aiming to be China's gateway to Europe beats waiting for Ireland's property market to rebound.